This site is run using the wordpress blog software. While setting it up I couldn’t find a theme that I liked, so I decided to make my own. Nearly-Sprung is a rework of Becca Wei’s “Almost Spring” using the same orange and green colour scheme. However I modified it to be a three column blog with fluid centre column, and optimised for vertical layout so its possible to not have any vertical scrolling on a 1024×768 screen. Also note that to have random header backgrounds, just drop in a 80 pixel high jpg starting with the name “headerbackground-” and it’ll automatically be picked up and used. Feel free to download and use on your own site. The code is GPL except the header image supplied, which is under the Creative Commons Attribution-NonCommercial-ShareAlike 2.5 License. I really love your theme. In fact I changed the colors & used it for my blog redesign. However, I can’t seem to solve a problem with ordered and unordered lists. The bullets get thrown off. See this latest post at http://www.coaching4lesbians.com/blog/2007/03/29/whos-been-living-in-your-skin/ The last bullet doesn’t show up at the beginning of the sentence but rather the 2nd part of it. I have posts where it is much worse because the glitch occurs earlier in the unordered list. OH My.. definately this is much better than the old almost spring that i using now. downloading… will try on this. cool …. thanks!! 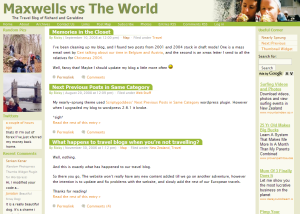 This theme is very cool, after searching for some 3 column themes i found this is useful for my blog. Hi. Thank you for this theme. Very nice and simply to use … thanks! Oh cool, a site that still uses Almost-spring (or a variant) with Wordpress 2.3.x. Was afraid to upgrade incase my theme couldn’t be used anymore. Ugh, but i will have some problems with the plugins. This is a great, clean theme… I know there is an obvious answer to my question, but I’ve been working on this for a while now and can’t seem to figure out where to tweak the CSS to change the px dimensions on the placement of the top, “PAGES” menu. Great theme – thank you! - any chance of updating to take advantage of 2.7 enhancements? I got it figured out – again, great theme! Ben (and anyone else) interested in taking advantage of the updated comments functionality– I changed the wp files you need to update to do that, based on the explanation found at wordpress.org. Assuming you haven’t done any hacking of the comments.php file, you can just extract the files in the zip file I created here into your /wp-content/themes/nearly-sprung/ folder.